From networking tips to what to wear — this guide, published by HubSpot, answers almost any question you might have. Keynotes – Headlining events featuring speakers like Martha Stewart and Guy Kawasaki. Bold Talks – Short, TED-talk style sessions. Here’s a preview. INBOUND Stories – Case study sessions featuring INBOUND success stories. 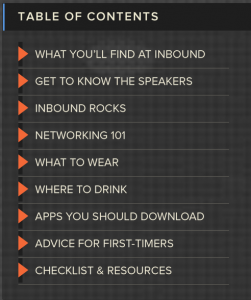 INBOUND Experts – Educational sessions, where attendees learn INBOUND principles and skills. INBOUND Insights – Small break-out discussions about INBOUND. 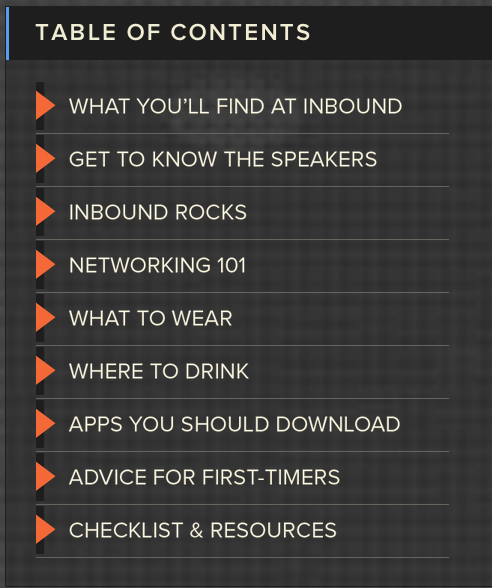 HubSpot Deep Dive – More tactical classes on using HubSpot’s INBOUND tool. Ask Me Anything – Q&A in small groups. FutureM – Discussions around the future of marketing. 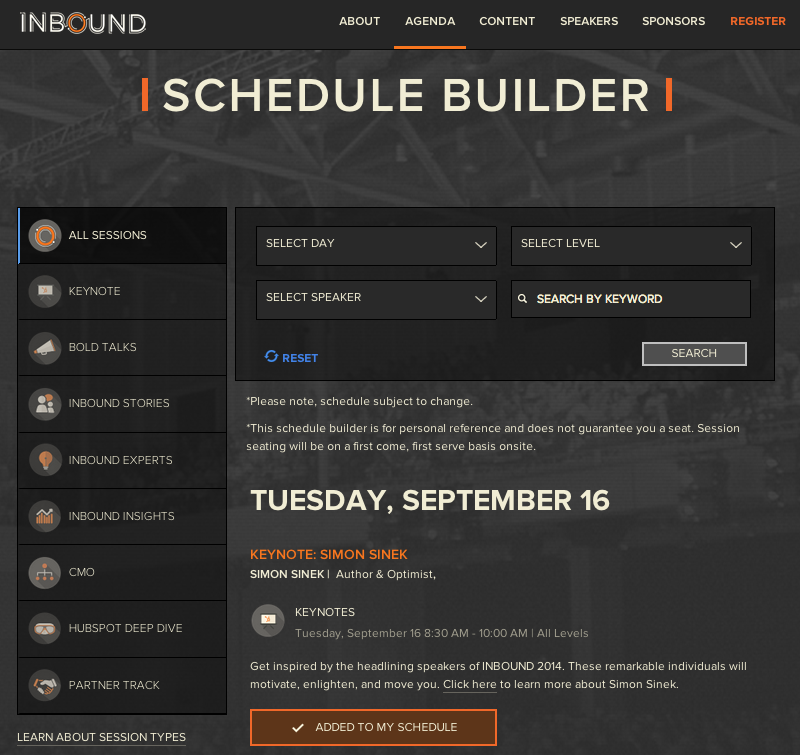 The folks at INBOUND have created an incredibly simple and pleasing tool to sign up for and organize your attendance. If you’re anything like me, you’ll likely register for everything and then use the tool to go back through and prioritize — sadly removing sessions from your list because you don’t have the time to clone yourself and attend everything. As a resident of Colorado, I am a big beer fan. We are a craft beer hot-spot and checking out new breweries is one of my favorite things to do. Which is why I was thrilled when Revenue River published a list of the best breweries to check out in Boston while at INBOUND. This list is exactly what I need to get a taste of Boston while I’m at the conference. 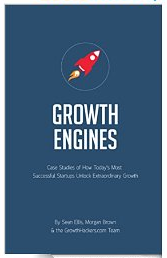 Sean Ellis recently published a book, Startup Growth Engines and will be speaking at INBOUND. Download his book for only $2.99 to read and get the most out of his talk. For the second year, charity : water is the INBOUND charity. The organization is focused on rethinking how nonprofits inspire change by engaging those who care about bringing clean water to communities that need it. This guide is simply awesome. You start by choosing a persona (that is so HubSpot :)) and are then provided with customized recommendations from locals on sites to see and places to visit. Try it out, I’ve already started laying out my Boston site-seeing activities!